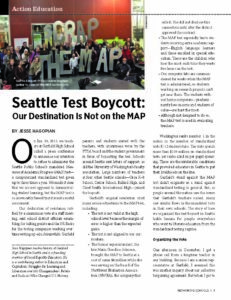 Teachers had been complaining of the many flaws of the MAP test for years—including by resolution at a citywide union meeting in 2010—but now it seemed Garfield teachers were ready to take action. We organized meetings of teachers in the tested subjects—reading and mathematics—to see what action they might be prepared to take. That was it. A unanimous vote to boycott the MAP test followed.